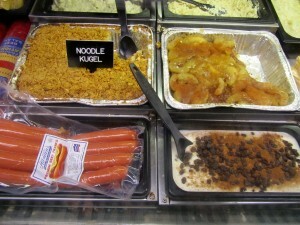 “Authentic New York Delicatessen (only better)” It is their motto; one that has been since 1915. My son said last night “this is not AboutMyBeaches”. My husband said, he could not believe I did not have “The Original” which is the Cloak & Dagger; corned beef, cole slaw and Russian dressing. My other son, said “hmm I am ready to go”. That’s more like it!! I, well..the t.v. was on early this morning and there was a person talking about the food waking up your senses, etc. etc. I tell you, what woke up my senses. Wait a minute, I should say what woke up my hunger. After being at the Baltimore Farmer’s Market last Sunday, Susie, my sister in law, said that instead of eating at the market we could go to “corned beef row”. That did it and it was great. Their reputation is unsurpassed. 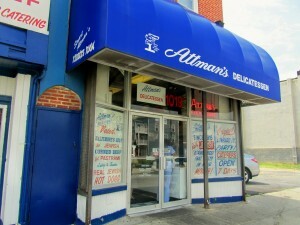 Attman’s is located at 1019 East Lombard St., Baltimore, MD. 21202. Tel. 410-563-2666. Website? 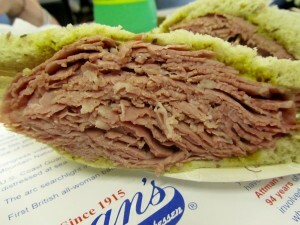 www.attmansdeli.com. It was about 1:00 p.m. and there was a line. 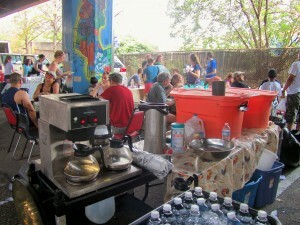 The place was bustling. Dishes coming out, pastrami here, mustard there. Don’t leave it too lean. My wife is waiting in the car. I was like, what the heck am I going to order? 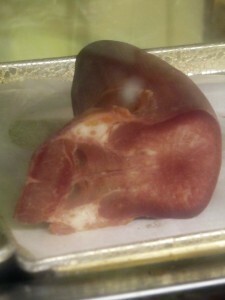 I was also looking at the cases with some of their offerings including tongue, probably for their Tongue Fu sandwich which has beef tongue, pastrami, corned beef and Swiss, topped with spicy mustard. I got some help. They do have a friendly staff. He told me to get the corned beef with mustard on rye. I was a novice. 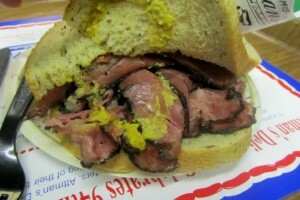 Or, the pastrami, same way. I just needed more time. Regulars knew what they were ordering. Okay, okay; one corned beef, mustard on rye, one pastrami, mustard on rye, one cole slaw and 2 drinks. 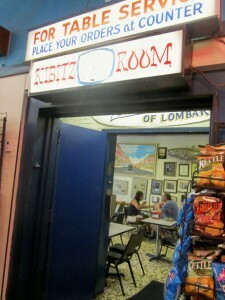 Then, off to their Kibbitz Room for dining and chatting. Susie and I split our sandwiches so we could experience both meats. She thought she loved the pastrami the best. I thought mine was just as good. My husband kept texting me that had I ordered the wrong thing. Haha, a good excuse to come back. Through our lunch at Attman’s, there was never a line with less than 5 people. 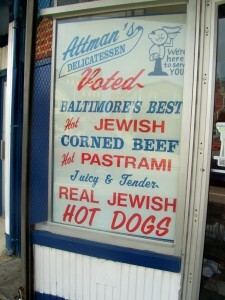 Attman’s is near the Inner Harbor. My husband told me that when he was young. I should say younger; he is probably reading my blog, Attman’s was his “paycheck treat”. 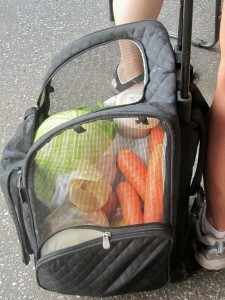 He also remembers when Corned Beef Row was like an outdoor grocery store. Chickens, meats; all Kosher. 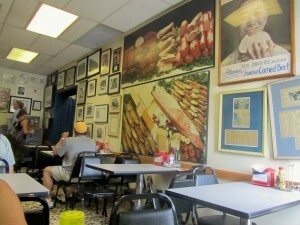 Attman’s is an old style Jewish deli. It does not need an introduction. It speaks for itself. 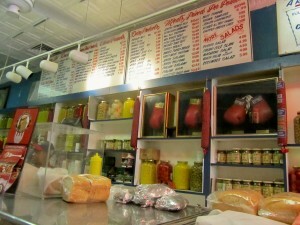 If you want to know more about it, check out their website, www.attmansdeli.com. Or, you can also go on line and visit www.citypaper.com/news/story.asp?id=6044. 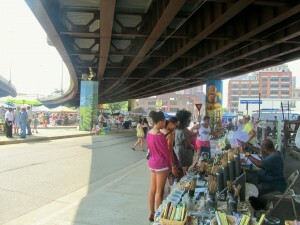 This article explains the good times and the hard times of this important street in Baltimore. It has taken me all week to write about 24 hours in Baltimore. I still have 2 more posts. This City that has been knocked down in the news, even though it has so much to offer. A lot of tender loving care? Of course, and some of you are trying, I know. In the meantime, I am looking forward to another visit. I already know what I am going to order, regardless of what my husband says. 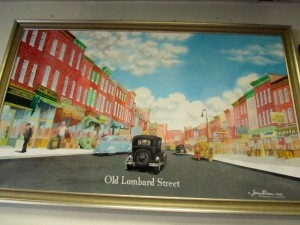 The Lombard Street sandwich has hot corned beef, hot patrami, chopped liver and Russian Dressing. Cannot wait!! 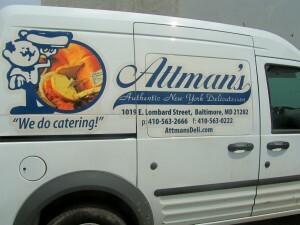 Note: Attman’s offers off-premise catering service throughout Maryland, Washington and Virginia. Ask them about their “Lombard St. Party” which for 50 people or more at your location. Have a great day! Talk to you….later…. 6 miles of ocean and bay shoreline, swimming and sunbathing, surfing and sailboarding, and so much more. Sounds good, doesn’t it? If you are visiting the Delaware Beaches this week-end, well, it is going to be hot and muggy. But, the following two events might be something you might want to check out. Both are on the water so it will definitely be cooler. If you have your friends and family visiting then I would drag them to it. Something different. 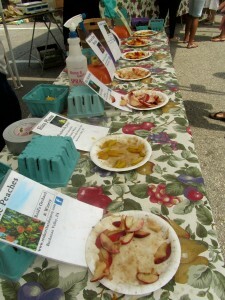 Saturday, July 30th, from 10 a.m. until 6 p.m. is the Seafood & Arts Festival. It is free!! It will be at the Indian River Marina. There will be live music, fresh seafood and platters, family fun and Lollipop the Clown will be there, as well. You can call 302-227-3071 if you need more info. or visit www.destateparks.com. The marina looks beautiful. I had the opportunity to visit a few weeks ago, and was completely impressed by it. My husband stops for breakfast once in a while. You cannot beat the scenery!! There is a lot of construction right by the Inlet, but the marina will be just north of the bridge. There will be plenty of signs for the festival. On Sunday, July 31st, is the Maritime Heritage Festival at the Indian River Life Saving Museum from Noon until 5 p.m. Tickets are $8 for adults, $4 for ages 4 to 12, 3 years and under are free. This museum is gorgeous and definitely worth seeing. In one of my posts, I remember writing that for so many years I used to drive by it; would glance and never gave it another thought. Well, that completely has changed. It’s worth visiting; learnig about the life of the people that looked after our coast. Therefore, on Sunday it will be a day of entertainment, crafts, games and food for the whole family. 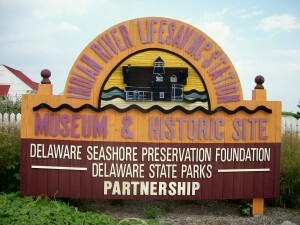 The Delaware Seashore State Park is celebrating Delaware’s Maritime Heritage. For more info., please call 302-227-6991. 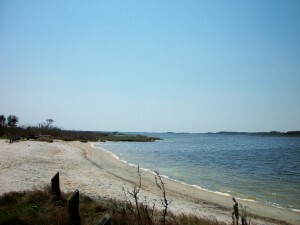 You can also visit www.destateparks.com. At 1 p.m. and 3:30 p.m. – Songs and stories of old sailing days by Matthew Dodd. At 2 p.m. – Breeches Buoy Demonstration. There will be maritime crafts and games. Also, tours of the Life Saving Station and Sailor Tattoo Face Painting. Enjoy the beach; kick back and relax!! 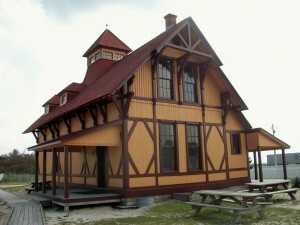 Note: I wrote a post on the Indian River Life Saving Station Museum on 8/29/10. 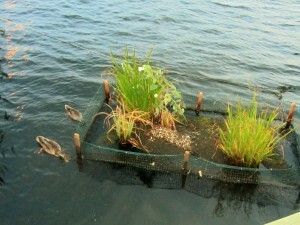 If you would like to see it just click on the month of August, 2010 and scroll down to the date. You wil not be able to miss the museum, it is just north of the inlet. 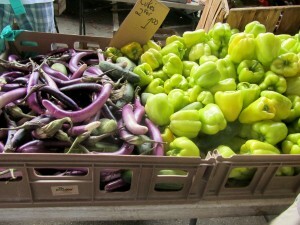 If you are a habitual visitor to farmers’ markets you know that the best way to get prime produce is to be the first in line as they open for business. I don’t think you will have to worry too much at the market my sister in law, Susie took me last Sunday. It was unreal. Huge; so much. 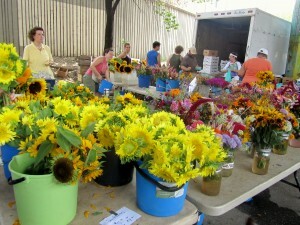 The 34th Annual Baltimore Farmers’ Market & Bazaar opened a month earlier this season; in April. The last day will be December 18th. 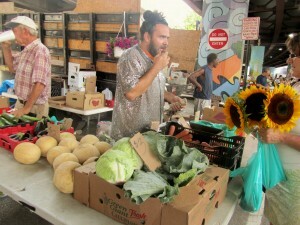 Every Sunday from 7 a.m. until 12 Noon you can expect these vendors to showcase the best they have to offer. 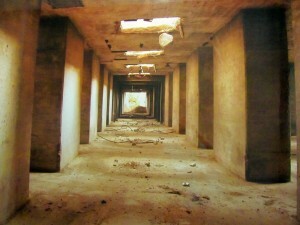 The location is underneath the Jones Falls Expressway at Holliday & Saratoga Sts. There is free parking available or you can park on the street in the first spot you can get. I did not have any trouble finding parking. This is one of a kind shopping and dining experience. 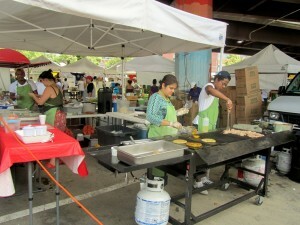 Besides the most gorgeous produce, food vendors add their own unique spice to the market with a diverse multi-cultural cuisine. 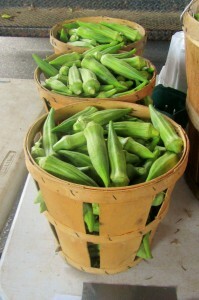 They say that on any given Sunday, 8,000 people visit the market. Overall the visitors are in the 200,000 for the season. More info? Please visit www.promotionandarts.com. Or, you may call 410-752-8632. I was taking it all in. First you cannot believe that is under the expressway. 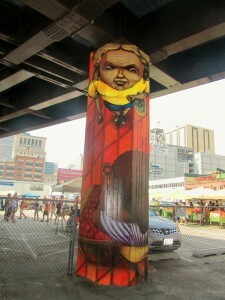 Then, the columns holding the expressway are all decorated. I found out that this is called City Paint 2011. The Baltimore Mural Program. 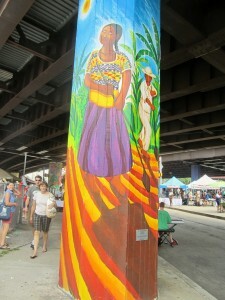 This year Baltimore will be decorated with numerous murals throughout the city. This program is sponsored by the Mayor’s Office of Neighborhoods and produced by the Office of Promotion & the Arts. For more information; they do need volunteers, please visit www.promotionandarts.com/index.cfm?page=artscouncil&id=9. This particular mural is called The Farming of Corn 2008 by Joel Bergner. 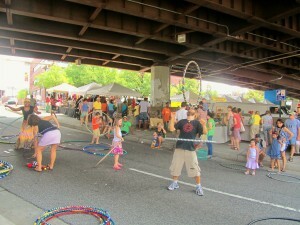 People were walking, eating; some kids enjoying themselves as only kids do. 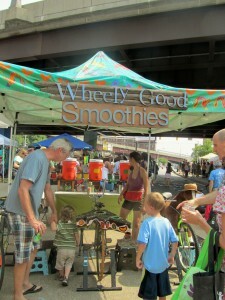 Okay, the Wheely Good Smoothies caught my attention. 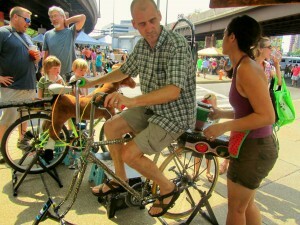 Pedal to get a smoothie or they can pedal for you. 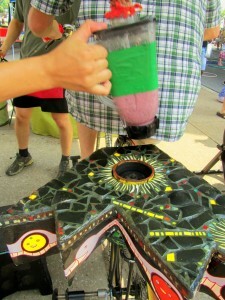 Their website is www.wheelygoodsmoothies.com. 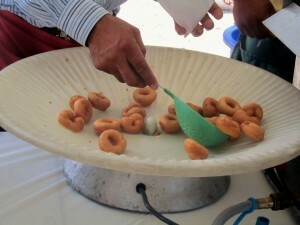 Migue’s Magnificent Mini Donuts had a line. 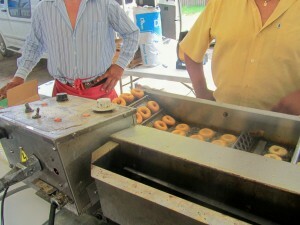 They are small donuts. Ha, that’s a good way to fool you. Supposedly, they are low fat and delicious. A small bag of 8 pipping hot ones is $3. For $5 you get 16 minis. Or, if you want the Donut Lovers Box, you will get 40 donuts for $9. The produce was unreal. 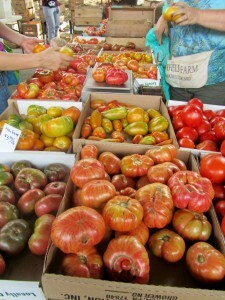 The tomatoes…just take a look at them. Different sizes and colorations. 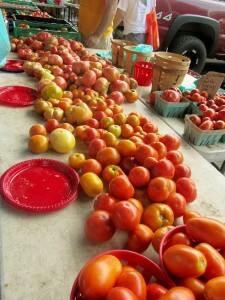 A tomato tasting? Yes, tasting different kinds before making you choice. They were delicious. 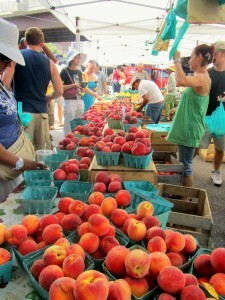 The same with the peaches. Another tasting; the sweetest I have tasted. I got some white ones. 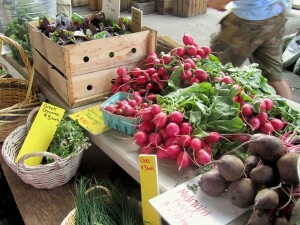 These were the biggest radishes I had ever seen. 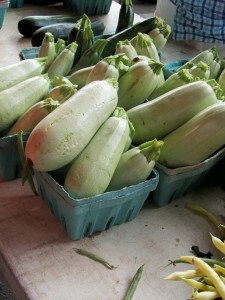 White zuchinni? 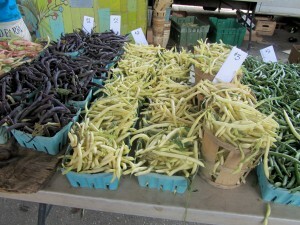 Black and white string beans? 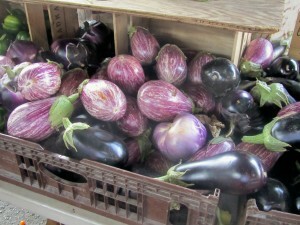 Beautiful eggplant. That aubergine color was gorgeous. 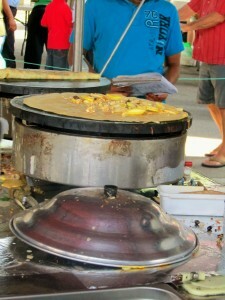 It was good to see that the vendors took their time to talk to their customers and answer questions. Everyone seemed to have their favorite. Susie and I did not have anything to eat here. 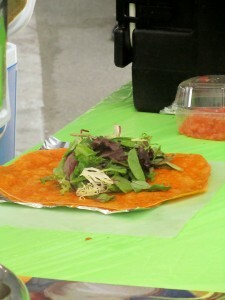 But, there were so many choices; healthy, diverse, and international, including vegan and gluten free items, as well. 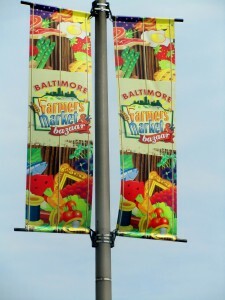 I have been to several Farmers’ Markets; California, Colorado, Florida, Delaware, but this ,in Baltimore, was by far the biggest one. If you are a resident of Baltimore, I cannot imagine you have not heard about it; but if you are visiting Charm City this could be a great place to have breakfast on a Sunday morning. And remember this market will be on-going until December. Susie and I? 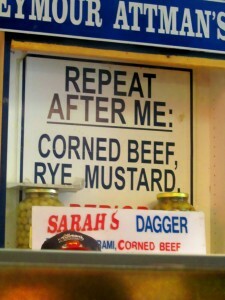 Oh no, we were on our way to Attman’s on Corned Beef Row…. and points in between. Yes, sometimes I might be on my way somewhere and the opportunity calls to check out a food truck, a tapas bar, a new beach, or a new museum. That’s why it is so much fun about writting a website in a blog style. It is a diary, yours alone. AboutMyBeaches has made realized that I want to know and experience more. I remember when my webmaster, Ed Timmons from 4C, Inc., http://www.4cinc.com, mentioned I should write a blog instead of the standard website. I guess he figured I was talking his ear off so I was a good candidate for bla, bla, bla. He just did not know how much I could talk. Then, I started blogging, only a few readers here or there. People that are connected on the internet suddenly started to find me. I think my posts are honest and from my heart. I have posted so far 728 posts, and now I am getting over 14,000 hits per month. Who would have thought? And, you know what? I want more. Granted, some posts are more interesting than others; so its life itself. Remember that it is a diary. Pictures….I decided to incorporate them because people are so visual. Looking at a picture entices you to read. Well, I should hope so, even though I do have some friends that say they have read the posts but maybe they just looked at the pictures. I know who they are, right? Shelley, Debbie at times. Not Missy or Richard, though. My fault, I test them. My friends and my family have put up going out to dinner with me. My first statement as we sit down at a table is “don’t touch the food until I take a picture” and “can we all order something different?” I am surprised they even still want to go out with me. It is so funny because I get e-mails or suggestions on places to go and check out. I welcome them; we all have different likes and dislikes and I am an inquisitive person. The coastals towns that, I, predominantly promote, I love. There is something about living by the ocean. I know I am lucky. 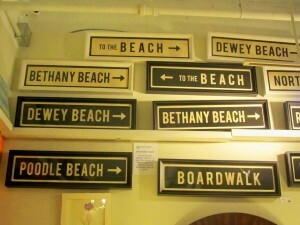 The Delaware Beaches have been home for many years and so good to my family. Giving them a push is not a brainer. I do offer advertising on my website. It is $500/ per year. I offer personal care. No clicks here or there. You are there to stay on my site. Thanks to the following advertisers. 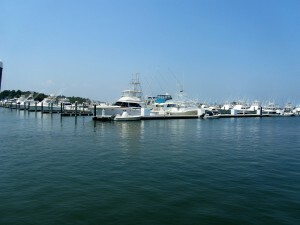 Tidewater Realty – http://www.tidewaterrealty.com. Delaware is Small Wonder. The beaches are so great. It has grown so much since I first arrived. Tax free, low property taxes and mild winters are an attraction. Tauriello & Com – http://www.tauriello.com. I have used this company in Delray Beach. That Village by the Sea has amazing unobstructed beaches, restaurants, shopping and I do have a place there. Sometimes I hate to pass the word around because I want it all to myself. Beach House Management – http://www.mybeachhouses.com. Michael knows I cannot live without him. He has been there to take care of my property, among other things, from day one. Your home is your castle and he is professional and knowledgeable. 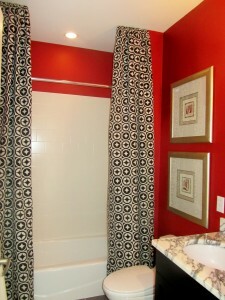 Anita Jennings Designs – http://www.anitajennings.com. I know her personally. 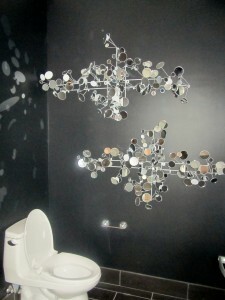 She is an interior designer based in Delray Beach. She is so easy to work with and very reasonable. Coastal Chem-Dry – http://www.chem-dry.net/coastal.de. Green carpet and upholstery cleaning. We all needed at times. It is family owned and operated. Angie is the man!! Doggies at the Beach – http://www.doggiesatthebeach.com. The home away from home for my Addy. She is my rescue. Jim and his staff love their customers. Cage free with 24 hour human supervision. Very involved in the community, as well. 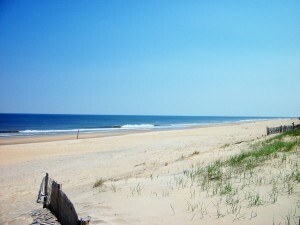 Vacation Rentals – http://www.vacationrentals.com/vacation-rentals/rehoboth-beach-delaware.html. This is a national company; part of the family of HomeAway. 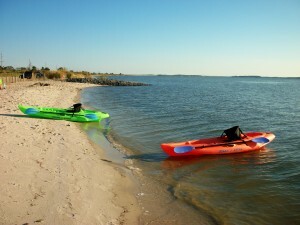 The properties you will find in this particular site are for Rehoboth Beach. 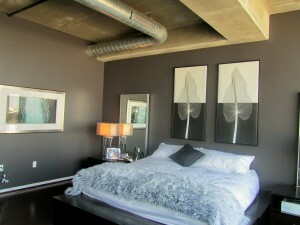 Rental properties for all seasons. I thank them all. If you are interested, please contact me. I have posts to write. A few still left from my 24 hours in Baltimore, Maryland. 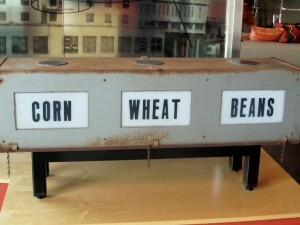 Events going on at the Rehoboth Museum, a must if you are visiting Rehoboth Beach. On the Rocks is, believe it or not, inside the terminal for the Cape May-Lewes Ferry. Amazing views; casual, a beer or a hamburger, fries. I want to check the tailor in Rehoboth….got to go..have a great day!! Taking a walk after such a satisfying meal, on Saturday evening felt good. Susie had found out that the Inn at the Black Olive was just around the corner from The Black Olive. It is owned by the same family. 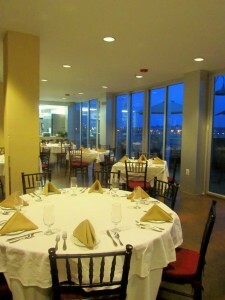 Besides wanting to check out the Inn we wanted to also check the rooftop restaurant called The Olive Room. Looking over the city at that time of the evening was going to be beautiful. What a surprise!! We were right in front of it. We just could not believe how big it actually was. 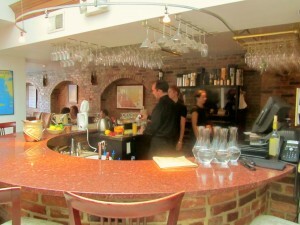 The address is 803 South Caroline St., Fells Point, MD 21231. Tel. 443-681-6316. The website? www.theblackolive.com. We went in and noticed that there was a market on the first floor. 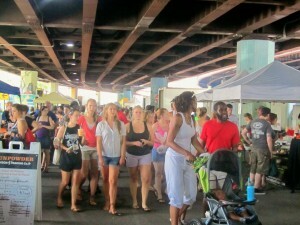 It is The Agora Market. If you are staying at the Inn at the Black Olive you can get a variety of provisions for your room. We asked if there was a possibility to see one of the suites. 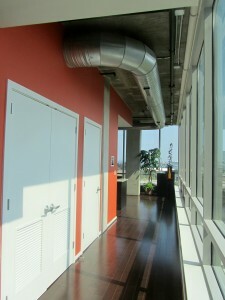 There are only 12 suites in the whole building; 2 on each floor. 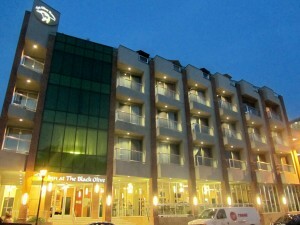 The Inn at the Black Olive considers itself the greenest hotel in Baltimore. 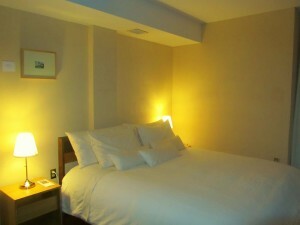 The Inn provides the most gentle and healthy environment possible for their guests. To see more info. on the green aspects of this Inn, please visit their website www.theblackolive.com. 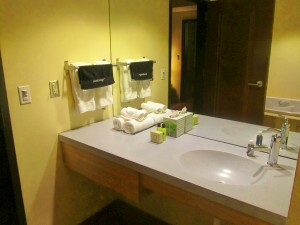 We entered one of the rooms and each of the rooms is equipped to handle all technology needs using some solar electricity. The rooms have organic furniture and bedding, olive oil/limestone bath walls, pipeless whirlpool, geothermal radiant heating and cooling. Organic breakfast and complimentary wine selection is available, as well. 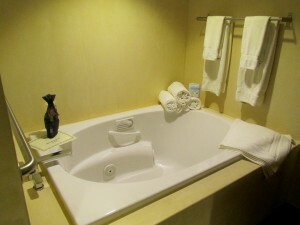 The suite that was shown to us was comfortable with a good size bedroom and bathroom. I cannot say the same thing with the living area. 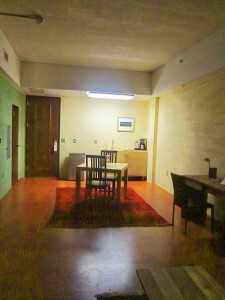 It seemed that the scale of the furniture and art were not in proportion to the size of the room. Something was missing. Off to the rooftop we went. 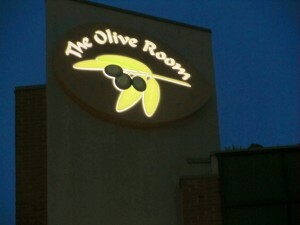 It is called The Olive room. We did not have dinner there, having just eaten at The Black Olive. We met Pauline, owner. She was sitting outside and we chatted a bit. 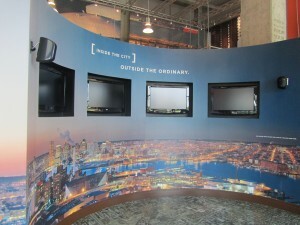 Then outside you will experience a brethtaking view of the city. You can dine or have drinks outside, as well. Really, it is gorgeous. Inside, the restaurant is well appointed. 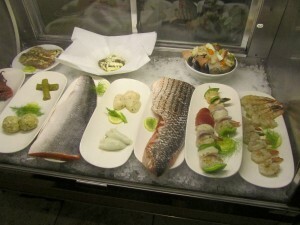 The menu looked divine with small plates to choose from or regular entrees. 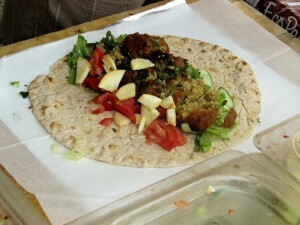 You can see the menu on the website above mentioned. We said our goodbyes with the promise that we would definitely, come back and make an evening of it. 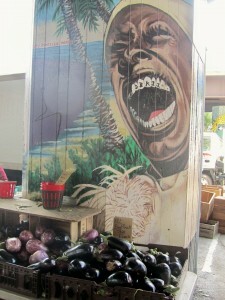 Note: Their website, www.theblackolive.com is a very good and comprehensive one. 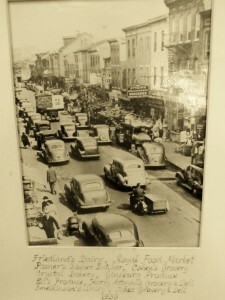 You will find so much on the history of the area. You will also find what makes this family of restauranteurs and innkeepers tick. I think that our Saturday evening was over…..spending the day with Susie was…priceless!! I was looking forward to again visiting The Black Olive. It has been a couple of years since my sister in law, Susie, introduced me to this Mediterranean restaurant, whose specialty is fresh fish. 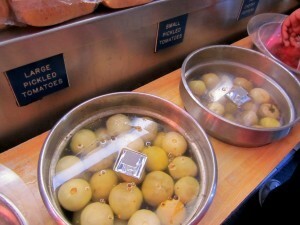 The Black Olive is also organic using the best ingredients found in the area. 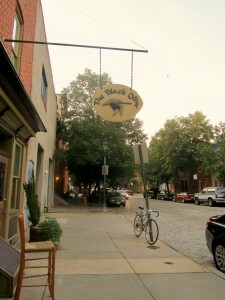 The Black Olive is located at 814 South Bond St., Fells Point, MD 21231. Tel. 410-276-7141. Website? www.theblackolive.com. 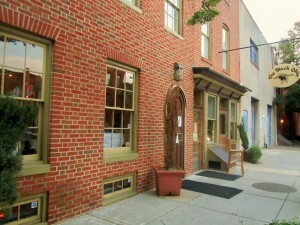 It is also located in the Historic neighborhood of Fells Point. Walking out and about in Fells Point is such a treat; the cobblestones adding to the charm of this neighborhood that dates back to 1726 and famous for its maritime port. 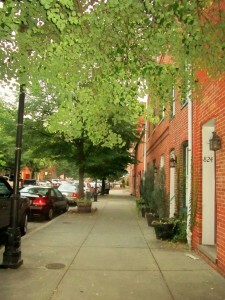 The streets are narrow; the row houses are so quaint and the aroma emanating from restaurants and bakeries is intoxicating. 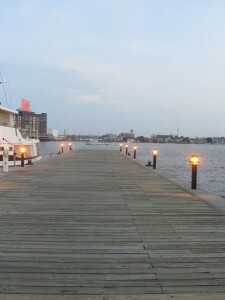 You can get to Fells Point by car, water taxi from the Inner Harbor, freeway and several bus lines. We were going to be early birds. Hot early birds since we had been sightseeing Charm City and summer in the city was, well, suffocating. It was, actually, a good time to arrive at The Black Olive because since it was only 6 p.m., the restaurant was not crowded by any means. I could take pictures. 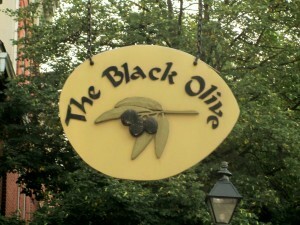 The Black Olive is as quaint outside as it is inside. 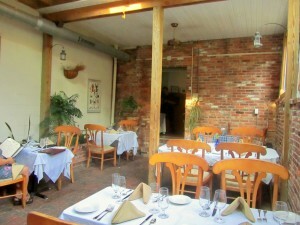 It is divided in smaller dining areas which is conducive to intimate dinners. 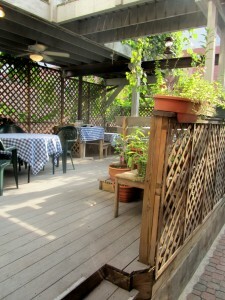 I noticed that a new patio, also for dining, has been added since the last time I was there. It was funny because I knew what I was going to have for dinner the moment I was en route to The Black Olive. If they had Bronzini, that was going to be my choice. 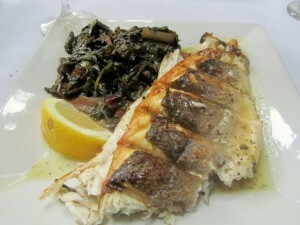 This is a Mediterranean Seabass that is also known as Lavraki, or Loup de Mare. It feeds on shrimp, which comes through in its taste. It is also a little flaky, but firm in texture. You see? I had it all planned out. The rest of my dinner would be just an enhancement to my main dish. 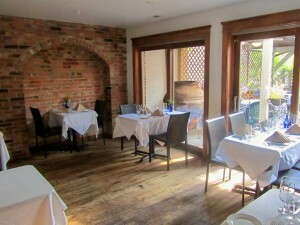 Susie and I were the first people seated in a light and open room in the back of the restaurant. 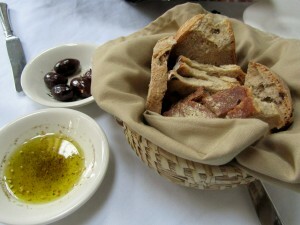 Immeditely, an order of black olive bread, black olives and olive oil for dipping arrived at our table. We were hungry and the bread was thick and crusty; the rest? Delicious. They asked us if we wanted to tour the fish of the day display. 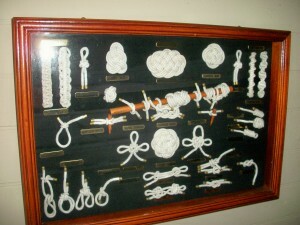 You can tour the display and ask questions. We knew what we wanted so we just stayed at our table checking out the rest of the menu. 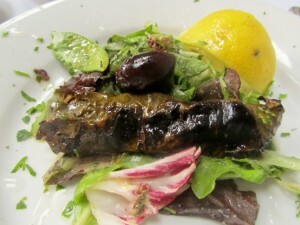 We first started with fresh sardines wrapped in grape leaves and brushed with olive oil; perfectly grilled. I had never had this combination and certainly would have it again. Delicously salty they were. I have my husband, kids and some friends trained on waiting for me to take pictures of the various dishes. Susie was talking longer to train. 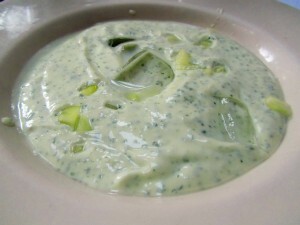 Then, we both chose the soup of the day; cold cream of cucumber soup. It was thick, and very refreshing; ice cubes topped the soup. 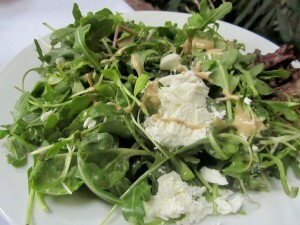 Susie decided to also have a mixed green salad with a lot of arugula and goat cheese. It had just a touch of aged balsamic vinaigrette dressing. She chose the Rockfish dusted with corn meal and pan sauteed. 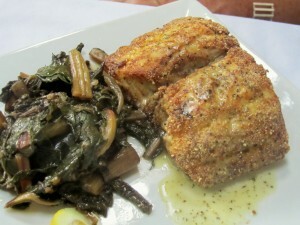 It was a good size piece of fish; the crust was nice and crispy and the fish was moist and perfectly seasoned. The main entree came with the vegetable of the day which was Swiss Chard, braised and sauteed with garlic and olive oil. My entree, which you already know, was the Bronzini. 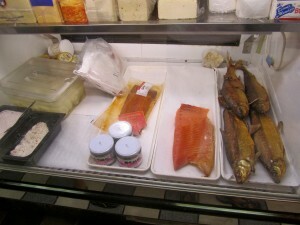 The fish was cooked whole and I chose for it to be filleted tableside. I have had Bronzini several times lately; hands down, this one has been the best. Flaky, firm and moist. 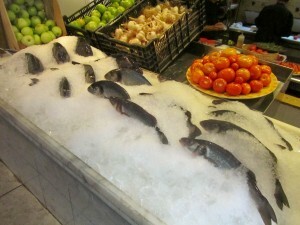 We also chose to have both fish entrees drizzled with their sauce of a simple black olive fish sauce. As the evening progressed, the restaurant was getting more crowded and some of the fellow diners congratulated Susie when they saw her dessert arrive. It was her birthday; compliments of the house. She got a treat of homemade ice cream with berries and a candle. Thank God, no singing or any other celebratory displays. We were not finished yet. 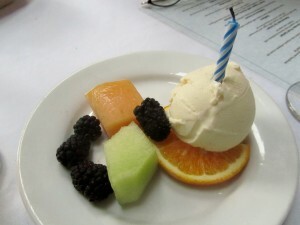 I saw on the menu that they had a homemade Blaklava Ice Cream, which they have patented. How could I leave The Black Olive without trying my downfall? We ordered a tiny scoop for both of us. 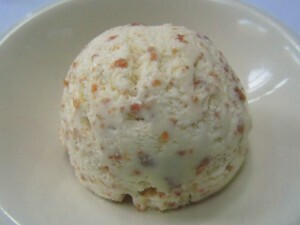 The Blaklava Ice Cream was full of the blaklava chips, creamy, but not overly sweet. I almost forgot to tell you that the service was very good. Prompt, attentive but discreet. The waitress knowing her menu well. We had to take a walk and ended at one of the many piers, just down the street from the restaurant. A nice evening indeed. You charmed me, Baltimore. No, no and no. I am not moving. I love living at the Delaware Beaches. Just curious to see how this historic and industrial area is up and coming. That’s all. Oh, they also had an open house. No appointments were necessary. Susie and I took off from the Basilica. 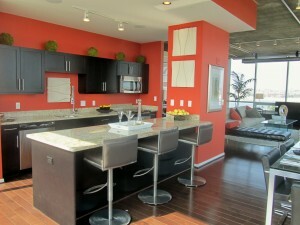 We zipped through the ever in construction streets of Baltimore with no problem. 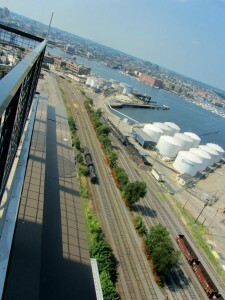 It has been now years since this industrial area has caught the eyes of developers. One of the first firms in the area is Under Amour, which makes its home in Tide Point, where a former soap factory once stood. 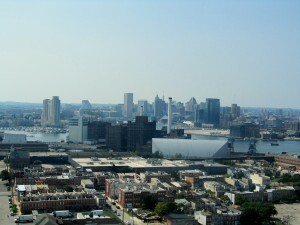 Historic Locust Point was once the center of Baltimore’s Polish, American, Irish-American and Italian-American communities. The building Susie and I were interested in seeing was called Silo Point, located at 1200 Stewart St., Baltimore, MD 21230. 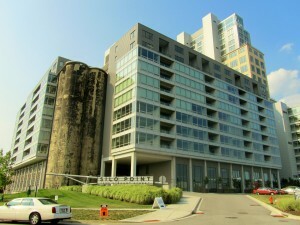 Silo Point is in its second stage and they told us that the building is 65% sold. 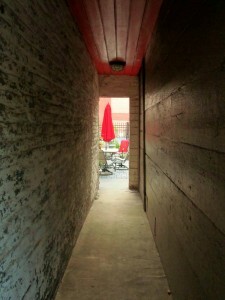 Silo Point in itself is very industrial looking; inside and out. 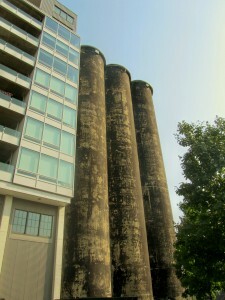 During the construction, they kept some of the silos/grain elevators, which is great because this is what stood here. Silos are used in agriculture to store grain; mostly bulk. 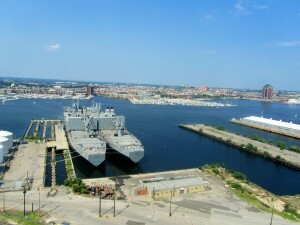 The Port of Baltimore is a major port in the mid-Atlantic states. It is also the furthest inland port in the U.S., and it is over 300 years old. I have had a few days to digest my visit to this condominium. I found it very interesting. Urban living with an edge. There were a lot of people looking through the building and as interesting and dramatic the views were; I am not sure if that type of arrangement would suit my lifestyle. 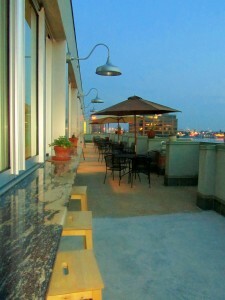 After meeting in the lobby, we were directed to a roof top. 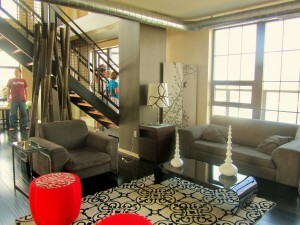 This area can be rented for parties, dinners, etc. 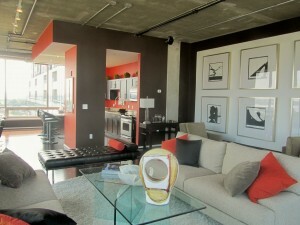 if you are a resident of Silo Point. If you don’t want your apt. dirty, then this would be the place to rent. 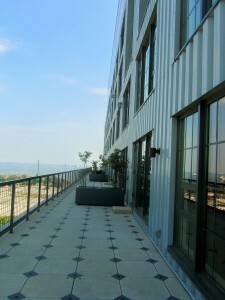 Fully equippped; balconies and those dramatic views. On one side you can look at the city of Baltimore, which is not far away, on the other is Fort McHenry. Fort McHenry is a must see historical site if you are visiting Baltimore. 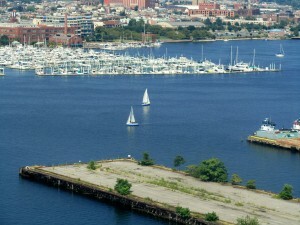 Another first for the city of Baltimore; it was the first fort built by the U.S. government. 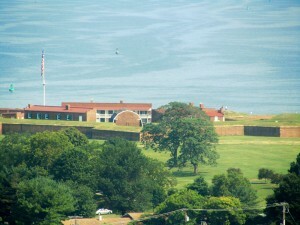 Fort McHenry is known for the War of 1812. It defended the Harbor from attack by the British Navy in the Chesapeake Bay. It was also during this bombardment that Francis Scott Key got his inspiration to write the Star Spangled Banner. The poem, which would become the U.S. National Anthem. But, you knew that, right? Just a reminder on how important the city of Baltimore has been through history. On the southern part of Locust Point I saw a cruise ship about to leave port. I don’t know about you, but I just never hear anyone taking a cruise from Baltimore. Apparently is a busy terminal. The cruise terminal is 65,000 square feet in a converted warehouse. 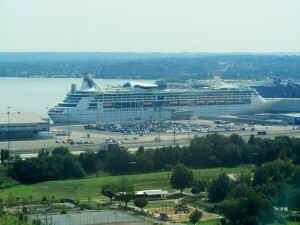 The major cruise lines using this port are Carnival, Royal Caribbean, Norwegian Cruise Lines and Celebrity. 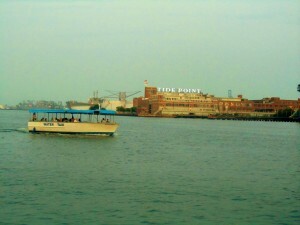 Please check http://www.baltimorecruiseguide.com/cruises.html. 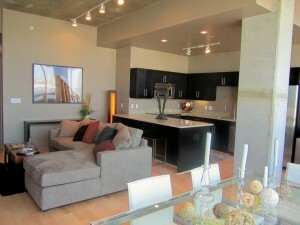 It was time to see some of the inside of these condos. They were very modern with different size ranges and prices. Monthly condo fees apply. No pool but gym and other facilities are an attraction. So, here is a picture of how it looked. And here are pictures of the different models. 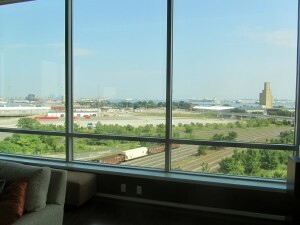 Large glass windows give you ample views. The train tracks are there and the train passes by a few times per day. 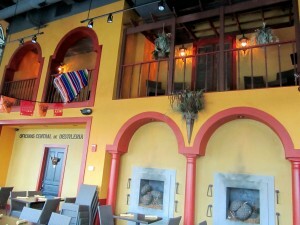 One of the restaurants that has opened at Silo Point is Miguel’s. I had to laugh. My brother’s name is Miguel. I did not eat at the restaurant, but went inside to get him a t-shirt. Interesting and colorful. I did hear that it is actually, pretty good and in a most unique location. 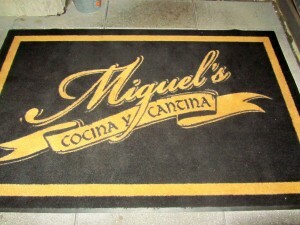 Their website is www.miguelsbaltimore.com. 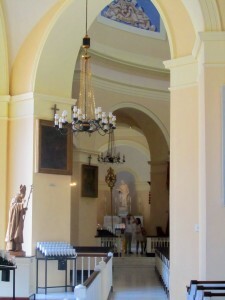 Construction started in 1806. It would become a symbol of religious freedom and a treasure for Americans of all faiths. 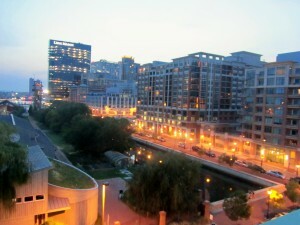 Baltimore, Maryland, is a city of many firsts, and this is an important one. 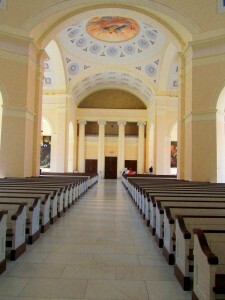 During its 200 years the Basilica has been visited by dignataries and historical figures from around the world. 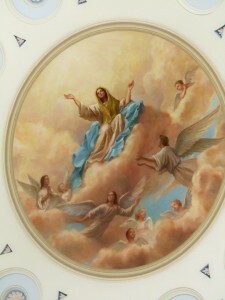 At least 15 saints or potential saints have prayed at the Basilica. Visit the website for a complete list of the many historic events that have occurred within its walls. 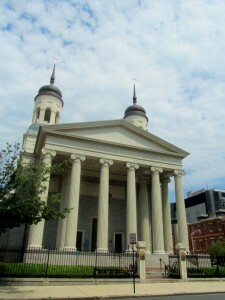 The Basilica is located at Cathedral & Mulberry Streets. Tel. 410-727-3565. Website? 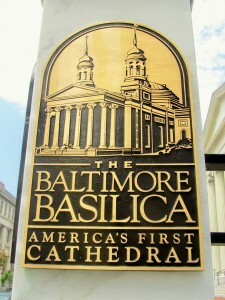 www.baltimorebasilica.org. There is a tour schedule which is as follows: Mondays – Fridays at 9:00 a.m., 11:00 a.m. and 1:00 p.m. Saturdays? Call to check availability. 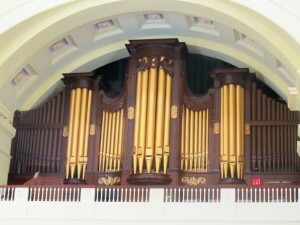 Sundays the tour will be at 12:00 p.m. If you happen to have a group of 10 or more then, please call for a reservation. No group tours will be scheduled on Sundays. There is also a Gift Shop and, of course, the most important part which is the celebration of Mass. 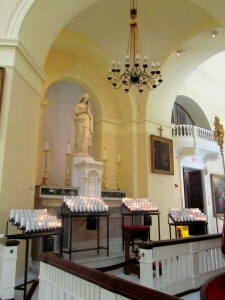 There is a daily Mass Mondays through Fridays at 7:30 a.m. and at 12:10 p.m. Saturdays at 5:30 p.m. and Sundays at 8:00 a.m., 10:45 a.m. with the choir, and 4:30 p.m.
You know how hot it was this past Saturday. Susie and I headed to the Basilica to continue our sightseeing. We were determined. 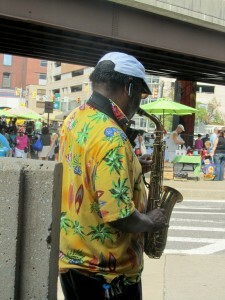 It was so hot that the streets in Baltimore were deserted. You cannot believe how gorgeous this Basilica is. It is also huge. The moment I went in I was in total peace and serenity. It does not matter what religious affiliation you are, this is a place for prayer and respect. 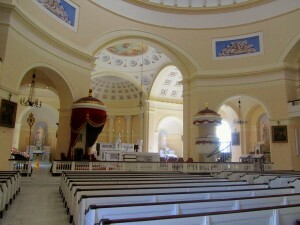 The Basilica is known as the Basilica of the National Shrine of the Assumption of the Blessed Virgin Mary. I immediately went to the area on the left hand side where the statue of Pope John Paul is located. I lit candles and prayed for the well being of my family. Just around the corner from the Basilica, at the corner of North Charles and Franklin Sts. you will find the Pope John Paul II Prayer Garden which was opened in 2008. 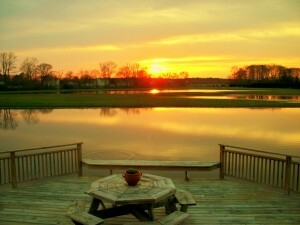 It is a quiet oasis for reflection and relaxation. 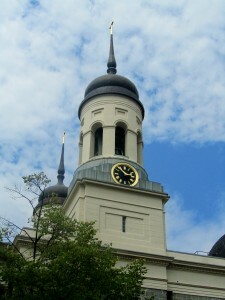 This Basilica began in 2004 an extensive renovation. 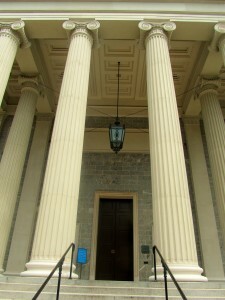 It again opened its doors in 2006 to commemorate its 200th anniversary. 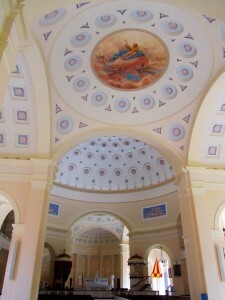 The Basilica had 24 skylights. They had been closed or removed over time. Now, replaced and illuminating the Basilica, they are a “living symbol of the light of religious freedom”, which was how they were intended to be. Another highlight of the renovation was the ability to be able to access the crypt from the inside the Basilica. 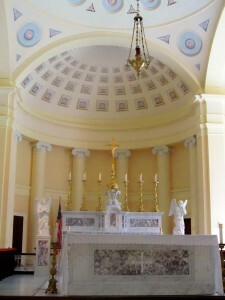 The crypt holds the tombs of Archbishop John Carroll, the first Bishop of the United States of America, Archbishop Martin John Spalding, and James Cardinal Gibbons. 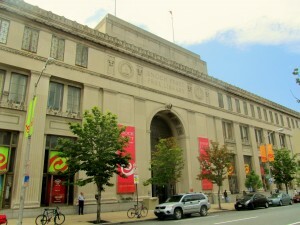 Note: Just across from the Basilica is the The Enoch Pratt Library. It is the First Public Library System with Branches in the United States. Another first for Charm City. Dear Baltimore: Stand proud. You are a beautiful city. To understand and respect your past will take you into the future. Another note: Some information for this post was taken from the brochure America’s First Cathedral. If you are the type of person that would like to have tours customized for you then, check the website www.zippytours.com. If you want to learn why they came to America, why they chose Baltimore and how they got there, then give Zippy a call.